Whether you believe in the stories of evil that have managed to raise the hairs on the backs of our necks, since we were kids, there are definitely some elements of evil that manage to capture our attention and imagination. To be fair here, people are rarely turning to demon tattoos designs as a form of worship in the dark arts; instead, it often seems to be a way of showing a level of respect to such darkness in life and a sort of lucky talisman that may help to keep these forces away from our door. Top of the list for demon tattoos designs must be the head honcho: The Devil himself. You must admit to finding it a little strange that someone actually wants any form of depiction of the evilest entity that is known to exist, but they really do. And what’s more, even some brave females are going in for tattoo pieces that incorporate this tyrannical demon as the main feature. 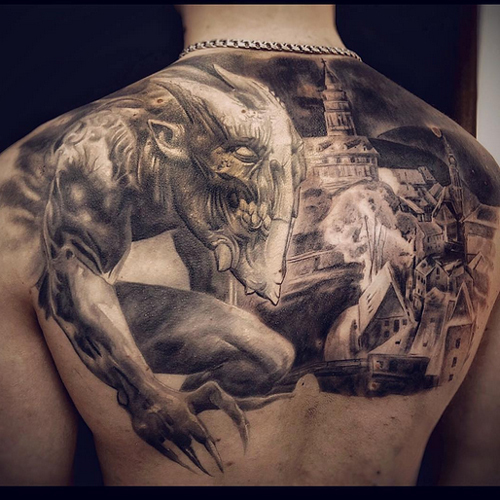 There are numerous other demonic designs to choose between and if you have ever taken a close look at the detail and effect that these tattoos exude, you will definitely be impressed with them way in which they translate onto the body. These pieces are nearly always done in black and gray shading and it has to be said that this gives off the most awesome results. Another evil idea is to have one part of a larger piece devoted to all that is evil and then the other side portraying everything that is construed as being good in this world. This works especially well as two separate chest plates, or maybe even each representation covering each arm. The whole of the back could also be devoted to this type of design. However you go about showing off such a piece of body art, this will always have a good balance of how many people understand our world to be. Then there are the designs that turn perfectly innocent critters into characters that are far more sinister. Some perfect examples here would be cherubs that are not quite as innocent and sweet as you may first think and angels that would definitely not be considered as heavenly individuals.